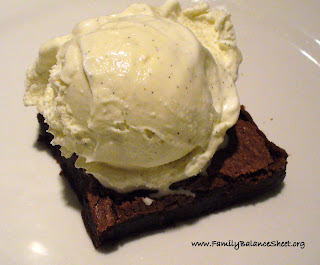 Homemade brownies and ice cream is my husband’s all-time favorite dessert. I made these recently and I took this simple dessert up a notch by adding the homemade whipped cream. This brownie recipe is from my grandmother. 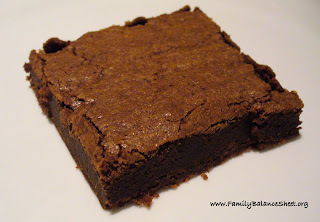 I found it recently, although I had never made it before, but this is the brownie recipe that I grew up with. 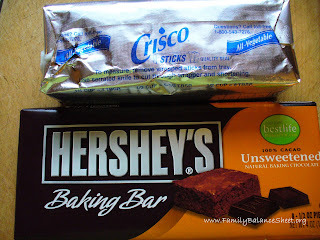 I was surprised when I saw that it called for Crisco shortening, but who am I to mess with perfection; this recipe blows away any boxed brownie mix…in my humble opinion. 2. Stir until smooth. Remove from heat and set aside. 3. 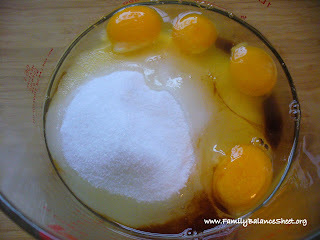 In a mixing bowl, mix together 2 cups sugar, 1 tsp vanilla and 4 eggs. 4. Mix until just combined and smooth. 5. 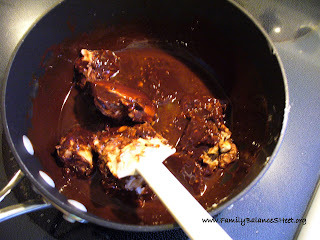 Stir 1 cup of flour and 1/2 tsp salt into the chocolate mixture. 6. 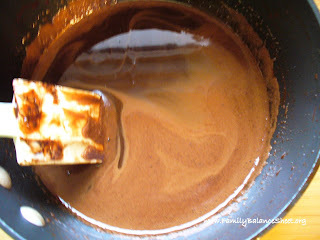 Pour the chocolate mixture into the egg mixture and mix until just combined. 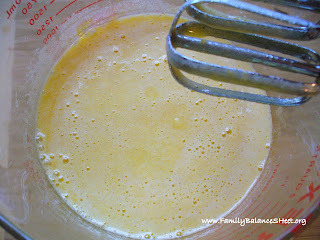 The batter is thick. 8. Bake at 350 degrees for 25 minutes. 9. Add your favorite ice cream. 10. 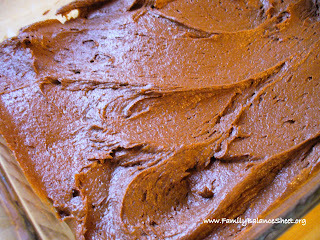 Be really decadent and add some Homemade Whipped Cream (recipe for homemade whipped cream is at the bottom of that link). If you would like to receive FREE updates of FBS through your RSS Feed, please click here to sign up. Or sign up for FREE email updates, by submitting your email address in the top left side of this site. Or follow me on twitter at www.twitter.com/fambalancesheet. I may need to try this recipe. I’m kind of a box brownie snob. I’ve tried multiple ‘from scratch’ recipes and have yet to find one that compares to boxed in my opinion. My teenage girls agree; every time I suggest we try another from scratch brownie, they wrinkle their noses and make a fuss. Wow. Looks yummy! I love brownies but never thought about making it from scratch. Thanks for the recipe. You! I’ve been dying to make brownies from scratch. I’ll have to give these a try. 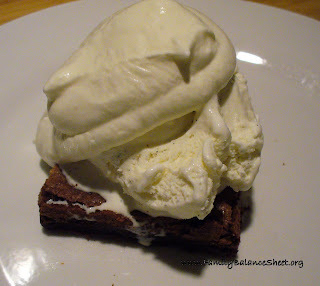 YUM…nothing better than homemade brownies and homemade whipped cream. Oh my! I’m always willing to try a new brownie recipe! This one looks heavenly! Yum! This sounds scrumptious! 😀 Love brownies!! This looks great! I’ve tried homemade brownies before and they ended up more like brown bricks…yours look fabulous! I’ll have to give it a try! okay…I have to admit that I occasionally buy boxed brownie mix, but homemade is my favorite. The key is not to over-bake!! Homemade brownies = comfort food. I see a batch in my near future, after I lose my winter fluffiness. 🙂 Thank you so much for this fine recipe and thanks for adding it to Foodie Friday. Have a great weekend! In a word…yum! I think I’ll exchange the homemade whipped cream for homemade ice cream!